After our beautiful sunny weekend it turned cold and rainy again so tonight I wanted something earthy and comforting as I settle in to watch the finale of Top Chef. 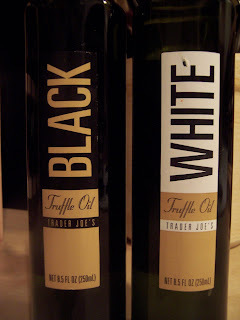 Another thing cheering me up is after my terrible incident (see comment 3) with my white truffle oil last week, tonight I went shopping at Trader Joe's and saw they now sell white and black truffle oil - at an unbelievable price. I told my sad story and showed my now-healing cut to the clerk who kindly gave me a free bottle of white truffle oil and I bought the black also. I LOVE Trader Joe's. Boil an ample amount of salted water over high heat. Meanwhile, soak dried mushrooms in hot tap water for 20 minutes or so, until softened. Roughly chop mushrooms, reserving soaking liquid. Drop ravioli in boiling water. Meanwhile heat skillet with butter and saute mushrooms. Add mushroom soaking liquid and reduce over high heat. When reduced by more than half, take ravioli out of boiling water, add to pan and continue to simmer. 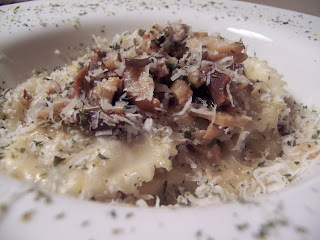 Remove ravioli to serving dish, simmer sauce until only 2 tbs of liquid remain with mushrooms. Stir in parsley, pour over ravioli. Top with Parmesan cheese, drizzle with truffle oil and garnish with additional parsley. Serve immediately. 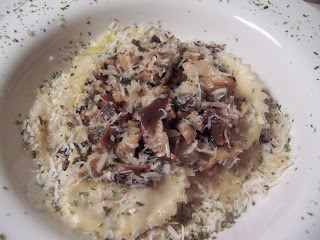 The chicken ravioli is a great recipe for doubling or tripling and freezing the extra. Layer ravioli between sheets of parchment paper and store in an air-tight container for up to 3 months. Drop into salted boiling water (still frozen) and they are ready in minutes. Poach chicken breasts and garlic in simmering water until chicken is cooked through -about 7-10 minutes. Meanwhile, sauté mushrooms, onions and garlic in olive oil until softened and turning golden. Remove from heat and combine all ingredients (except wonton wrappers & egg) in a bowl, set aside. Mix egg with a splash of water and beat with a fork for an egg wash. Meanwhile, lay out wonton wrappers in an assembly line. Working quickly, spoon 1 full tsp filling on wonton wrapper. Using a pastry brush or your finger, spread egg wash around the edge of the wonton wrapper. Gently lay another wrapper on top, press all the air out and make a tight seal. Trim edges with a ravioli cutter. How nice of the clerk to give you the oil! Now you can make delicious things with both black and white truffle oil - great! Oh, and I love your ravioli cutter! I know, it was really nice of him to give me the oil - unexpected and really generous. That ravioli looks and sounds divine! Can I move in?? I won't take up too much space! Lis can't move in... I am! I want to at least eat with you. Your meals are always so good. Cheers for a free bottle of truffle oil! I have never made ravioli...I'm on the hunt for a cute ravioli cutter like yours. 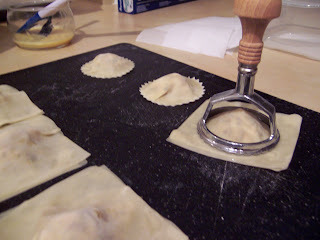 Ravioli is so easy with wonton wrappers and this cutter. I was recently shopping in Trader Joe's with my wife and newborn daughter. The cashier recognized us a regular customers and gave us a free bouquet of flowers to honor our new arrival. It's great that a store as unpretentious as Trader Joe's is so classy in the way it treats customers. It keeps me coming back. I agree re: Trader Joe's. They clearly understand customer service and brand loyalty concepts. I too keep going back. This chicken ravioli recipe looks really great. I was wondering if you knew where I could find a smaller bottle of black truffle oil? Or if there are smaller ones available? I don't need the whole bottle to make this one meal, and being a college student, I don't have the money or space to buy a whole bottle. It is so appropriate to cook to a dinner in house, I think the the combination between Chicken Ravioli with Wild Mushroom is fantastic. Interesting recipe with white and black truffle oil! I'll be making this recipe this weekend because my dad is coming after a year in other country. Thanks for posting this amazing recipe!